Birthday Wishes for Grandson: Grandparents are crazy about their grandkids because they bring smiles, laughter and joy wherever they go. If you too have a loving grandson who is the light of your life, show your love for him on his birthday. Surprise him with a cute gift and a greeting card. Pen down a beautiful quote in the card which he can cherish when he grows old. Instead of giving him boring life advice on his big day, do something fun by posing a cheeky picture of you both on Instagram or sending a funny message on Facebook. If your grandson is just a toddler, spoil him rotten with lots of candies and toys. Let your sweet gestures show him that you are a really proud grandma or grandpa. 11) Whether you step into my shoes someday or not, don’t ever step out of my heart. Happy birthday. 12) With a grandson like you, all our wrinkles feel worth it. Happy birthday. 13) There’s no extra space in my heart – all of it is filled up by a cute grandson like you. Happy birthday. 14) I thought I had done and seen everything there was to do and see in my life – until I held you in my arms. Happy birthday. 15) You are the only reason we look forward to growing older. Happy birthday darling. 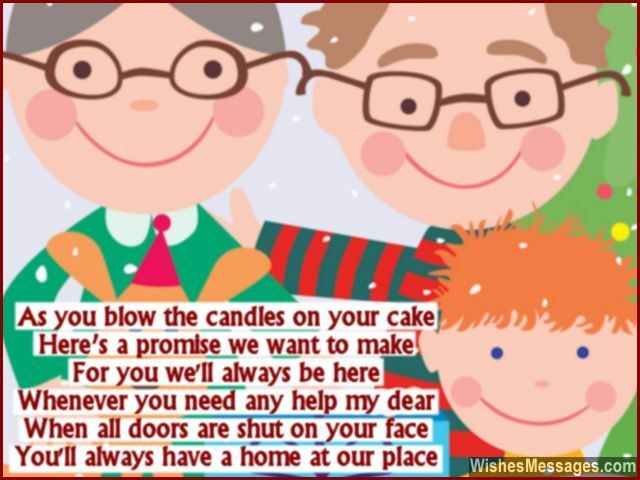 16) As you blow the candles on your cake, here’s a promise we want to make. For you we’ll always be here, whenever you need any help my dear. When all doors are shut on your face, you’ll always have a home at our place. Happy birthday. 17) Your grandmother and I promised each other to never fall in love with anyone else in the world. But then we became grandparents and ate our words. Happy birthday. 18) You are a messy, naughty, unorganized lazy and annoyingly loud teenager. But to us, you’ll always be our adorable grandson. Happy birthday. 19) Your delightful squeal is like a melody and laugh is like a rhapsody. My dearest grandson, you fill our life with beauty. Happy birthday. 20) If there is anything in life which is number one, then it is spending precious time with our grandson. Happy birthday. 21) Your mother got my eyes, your aunt got my nose and your sister got my chin. But you my dear, got my heart. Happy birthday. 22) Your friends will like and unlike you on Facebook, but we will always love you. Happy birthday. 23) I had a great time being a father to your dad. But I am having a better time being a grandfather to his son. Happy birthday. 24) Most folks of my age love showing off their golf kits, retirement party photos and gardening skills. I just like to show off my young and successful grandson. Happy birthday. 25) You have to grown up to be a fine young man, after all you are the grandson of such a charming gran. Happy birthday. 26) May the sun spread cute teddy bears instead of sunrays, may the clouds shower toys instead of rain and may the night shine with millions of candies instead of stars for my grandson’s birthday. 27) Happiness can never be constant, but that is we started believing after you came into our lives. Happy birthday. 28) I love being a granddad – it’s like being a cool dad without responsibilities. Happy birthday. 29) Just when I thought that all the fizz from life was gone, you came and added more soda. Happy birthday. 30) The last chapter of my life is going to be the finest – all because of a grandson like you. Happy birthday. 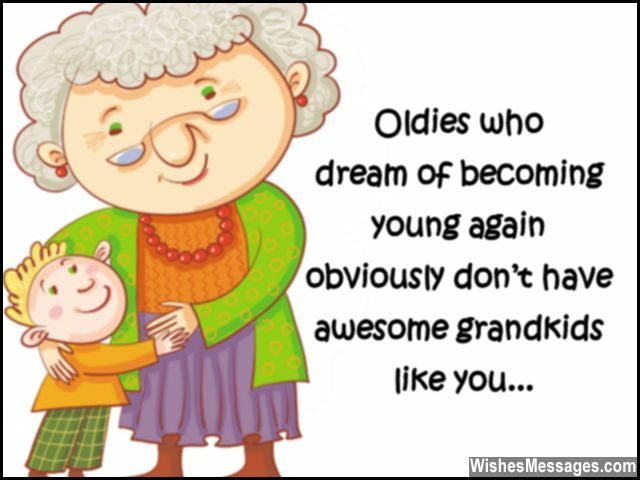 31) Oldies who dream of becoming young again obviously don’t have beautiful grandkids like you. Happy birthday. 32) Finally there is someone in the family worth passing on our genes to. Happy birthday. 33) No dish is perfect without salt, no matter how gourmet it is. 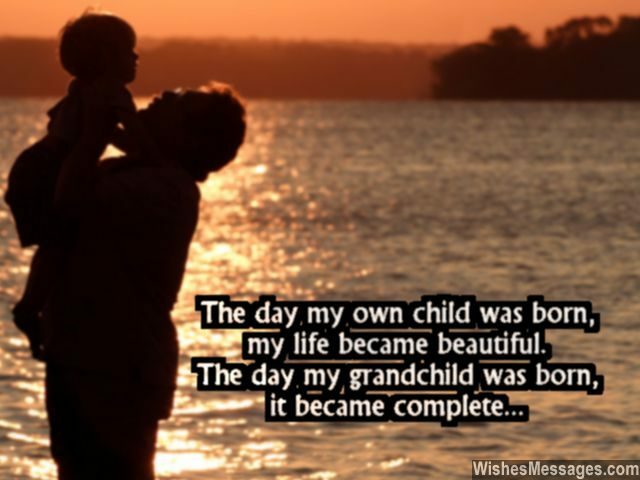 Similarly, no family is complete without a grandson like you, no matter how perfect it is. Happy birthday. 34) Whoever knew that the few years of being your grandparents would give us more happiness than many decades of our lifetime? Happy birthday. 35) The twinkle of the candles on your birthday cake signifies that shining star that you are going to be. Happy birthday. 36) With an amazing grandson like you, none of my colleagues will need to wish me a happy retirement. Happy birthday. 37) I don’t get my daily fix from my morning coffee or the evening news, but from the hugs and kisses of a loving grandson like you. Happy birthday. 38) The best moment in a grandfather’s life is when he has to catch up to his grandson who starts running too fast. Happy birthday. 39) You are the EXTRA in our ORDINARY lives. Happy birthday dear grandson. 40) A luxurious holiday is no good for relaxation, loving my grandson unconditionally is. Happy birthday.